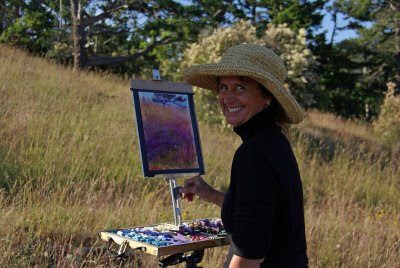 In this interview with our galleries, explore the creative process, inspirations and meaning behind the color-infused landscape works of artist Loriann Signori. Color vibration in nature and how to create it. My indoor studio is a house behind my house. I am fortunate to have the full support of my family who helped build it. About ten years ago, my Dad came from California to lead the three-month construction drive. The two- floor studio is built of recycled windows and doors and wood. It’s a beautiful space with full north light. It’s wonderful to walk out the door, across the yard and be at work – any time of day or night. I was a child when I first began plein air painting. The passion to paint outdoors has been a steady thread in my life. While the goals and methods continually change, the drive to be in the landscape while painting is still there. My work is about the vibration of colors. In particular, the way certain colors can combine to allow the viewer to experience their deep feelings – a connection to their heart. The landscape is the vehicle. Signori, “Choose Your World,” Oil on Linen, 36 x 36 in. I spend a considerable amount of time studying the landscape. I first paint small plein air pieces and make color notes. I study the landscape and instill what I see into my memory. My goal is to understand the essence of the landscape. Later, when I return to the studio, I allow this “information gathering” to work like a seed. I fertilize it by creating more small paintings – offshoots of the plein air piece. For me these new pieces, color harmony studies, work to help me understand the possibilities of color to create vibration. Like a writer composing a poem, the colors are my words, and when I rearrange these words I hear/see a different experience. The studio is the place where the real work begins. I build my paintings on ideas, and the multitude of color combinations available to me is my language. 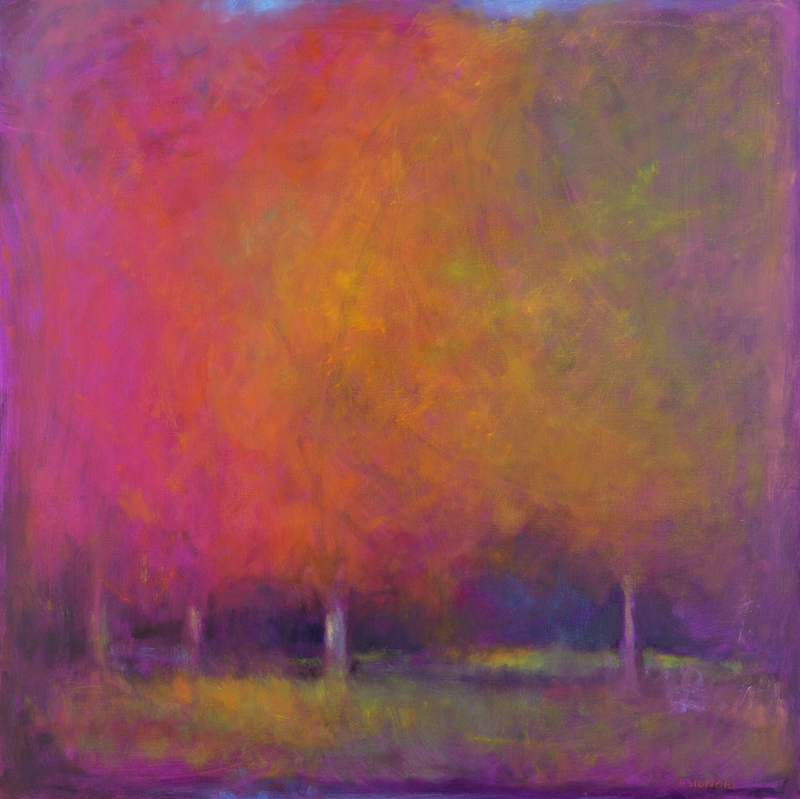 My goal is create the color vibration that allows the viewer to experience a deeper feeling. Each painting goes through a process that begins with an underpainting and progresses with thin layers of glaze. Oftentimes it is necessary to scrape, rub or sand the surface in order to maintain the translucence I desire. Like an opal, each layer of color affects the other layers. This constant alteration is not an intentional process but the byproduct of my striving to make something better. 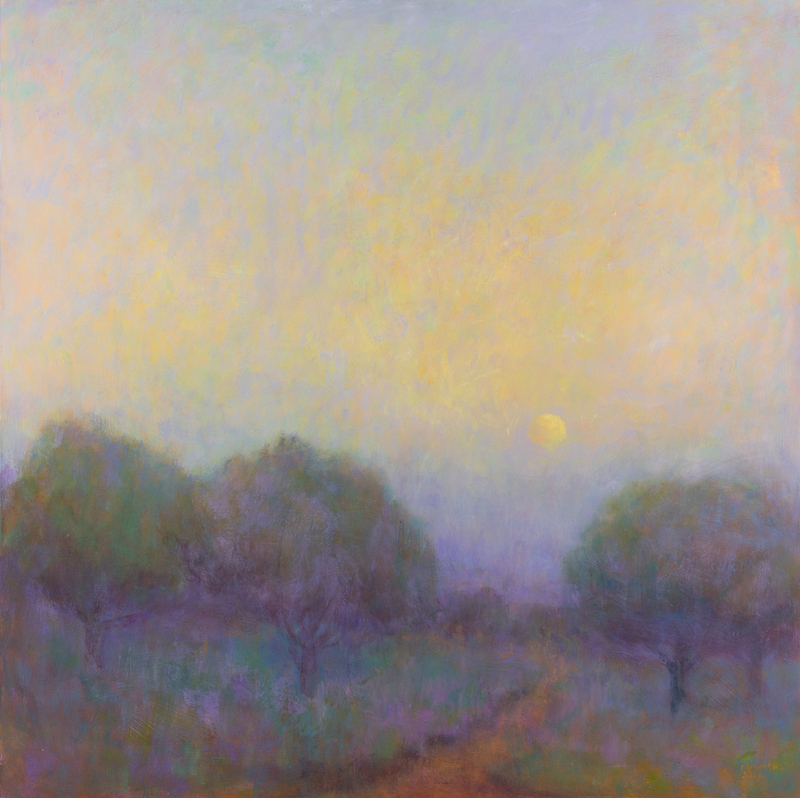 Signori, “Moonset,” Oil on Board, 36 x 36 in. 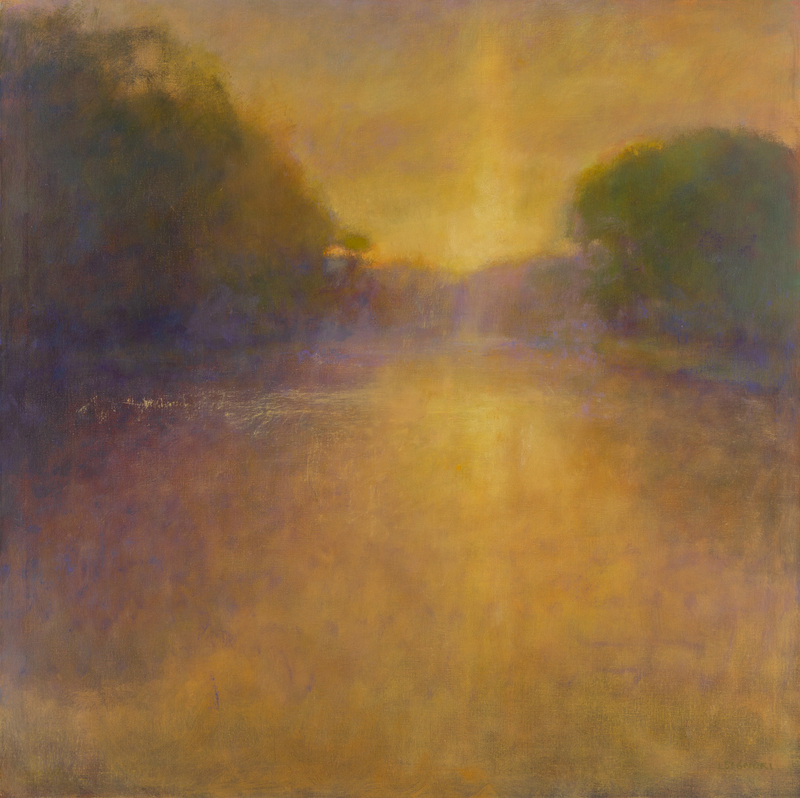 Signori, “Golden Eventide,” Oil on Linen, 36 x 36 in. Not as much see, but feel. I think that humans can experience their deeper feelings through color. It has become more distilled and less about place, more about feeling. 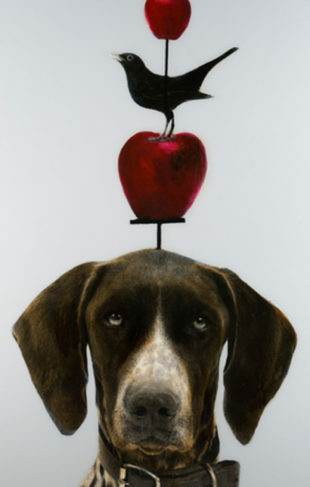 Signori has participated in numerous one person and group shows and has the honor of having her work included in private collections throughout the United States, Canada, Europe and Asia. 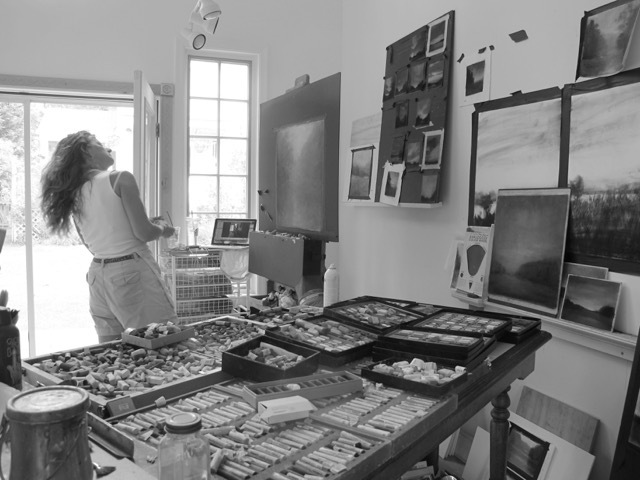 To view her latest works in person, visit the gallery nearest you.